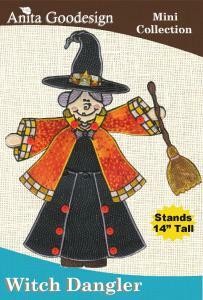 What holiday season would be complete without our scary lady with the mole on her cheek & broom in hand? The Witch Dangler, when finished will be well over a foot tall & all of her pieces will fit in a 5"x7" hoop. As always a special tutorial is provided for this & all other Danglers that will show you how to assemble your very own Dangler.